What would it be like to grow up as Superman’s kid? 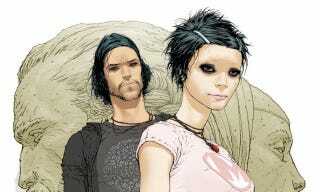 There’s no doubt that Mark Millar and Frank Quitely’s Jupiter’s Legacy, a look at superheroic family dysfunction, is the comic event of the week. Meanwhile, Atlantis has a new king, two thieves steal a curse and a vampire eats a crimelord, all in this week’s comics! • Amala’s Blade #1: The kingdom of Naamaron’s greatest assassin, Amala, is caught between the tech-hating Purfiers, the tech-loving Modifiers, and the Vizier who rules them all. • Dragon Age: Until We Sleep #2: Dwarven rogue Varris travels through the Fade, trying to wake his companions from their dreams and nightmares. • Other releases: Angel & Faith #21, The Answer #4, BPRD: Vampire #2, Dark Horse Presents #23, The Massive #11, Mind MGMT #10, Star Wars: Legacy: Prisoner of the Floating World #2. • Injustice: Gods Among Us #4: Superman learns that not all countries want to be taken over, and Batman forms a team of heroes to stop their former comrade. • Aquaman #19: The Ice King claims Atlantis’ throne for himself. • Justice League Dark #19: The Flash stops by to help the team defend the besieged House of Mystery. • Other releases: All Star Western #19, Arrow #6, Batman Inc. #10, Batman: The Dark Knight #19, Before Watchmen: Comedian #6, The Flash #19, Fury of Firestorm #19, I Vampire #19, Katana #3, Red Lanterns #19, Savage Hawkman #19, Superman #19, Superman Family Adventures #12, Talon #7, Teen Titans #19, The Unwritten #48. • Joe Hill’s Terrifying Tragic Treasury: A short collection of the acclaimed Locke and Key creator’s other macabre comics. • Teenage Mutant Ninja Turtles #21: The Turtles take their training to the next level in this special issue drawn by co-creator Kevin Eastman. • Other releases: G.I. Joe #3, Haunted Horror #4, High Ways #4, Jinnrise #4, Killogy #4, Judge Dredd: Year One #2, Kill Shakespeare: Tide of Blood #3, Kiss Solo: The Starchild #2, My Little Pony Friendship is Magic #6, Transformers #16, True Blood #12. • Jupiter’s Legacy #1: Mark Millar and Frank Quitely’s much anticipated comic arrives, as the children of superheroes seethe at a legacy they’ll never be able to live up to. • East of West #2: The apocalypse is already here, and fallout spreads over shattered U.S.
• Mighty Skullkickers #1: New numbering, new adjective, same skullkicking. • Other releases: A Distant Soil #39, Clone #6, The Darkness #112, End Times of Bram and Ben #4, Five Weapons #3, Invincible #102, Lost Vegas #2, Manhattan Projects #11, Morning Glories #26, Whispers #5. • Guardians of the Galaxy #2: London is invaded by Badoon, but the Guardians have bigger problems on the other side of the Galaxy. • Avengers #10: The Avengers head into a Garden Origin site to rescue the Canadian superteam Omega Flight. • Morbius, the Living Vampire #4: Morbius eats the Godfather of Brownsville and starts a gang war. This sounds completely insane. • Deadpool Killustrated #4: Deadpool kills all literature. You’re welcome, English students. • Other releases: A Plus X #7, Avengers Arena #8, Deadpool #8, Fantastic Four #7, FF #6, Fury Max #11, Gambit #11, Journey Into Mystery #651, New Avengers #5, Scarlet Spider #16, Ultimate Comics Spider-Man #22, Uncanny Avengers #7, Uncanny X-Men #5, Wolverine and the X-Men #28, X-Termination #2, Young Avengers #4. • Rogues #1: Two thieves in a fantasy world piss off a wizard and find themselves with a most unpleasant curse.... one that will make it quite difficult to practice their profession. • Rachel Rising #16: Rachel can tell when people are going to die, but suddenly she discovers that the inhabitants of an entire town all have the same expiration date. • Other releases: Bela Lugosi’s Tales from the Grave #3, Bionic Woman #9, Crawling Sky #3, Deathmatch #5, Freelancers #5, Helheim #2, Jennifer Blood #26, Last Zombie #1, Masks #6, Miriam #1, Night of the Living Dead: Aftermath #7, Princeless Vol. 2 #2, Queen Sonja #35, Steed and Mrs. Peel #7, Tarot #79. • The Creep: John Arcudi’s super-dark mystery about the mysterious suicides of two teenaged boys, and the disfigured detective who tries to figure out what happened. • Other releases: Bride of the Water God Vol. 13, Gantz Vol. 27, Ningen’s Nightmares. • Superman: Beyond the Man of Tomorrow: The Superman of Batman Beyond loses his powers just as a new foe arrives. • Blue Beetle Vol. 2: Blue Diamond: Jaime Reyes battle the alien scarab on his back and a monster who hunts runaway kids. • Other releases: Batman Illustrated by Neal Adams Vol. 2. • G.I. Joe/Transformers Vol. 3: The Autobots and the Joe return from Cybertron with a plan to destroy all Cybertronian tech, but Serpentor’s not going to make it easy. • Other releases: G.I. Joe: Tales from the Cobra Wars, Judge Dredd: Complete Brian Bolland Red Label Edition. • Other releases: Invincible Vol. 8 Ultimate Collection. • Twelve: 12 superheroes suddenly find themselves 60 years in the future, in a world that may be beyond saving. • Uncanny Avengers Vol. 1: Red Shadow Now: The joint Avengers/X-Men team formed in the wake of A Vs. X takes on the Red Skull and his S-Men. • Castle: Richard Castle’s Deadly Storm: The graphic novel of first book by fictional mystery author Richard Castle played by Nathan Fillion on the eponymous TV show. • Other releases: The Dark Tower: Gunslinger, Marvel Masterworks: Incredible Hulk Vol. 7, Marvel Masterworks: Mighty Thor Vol. 4, X-Men: Fall of the Mutants Vol. 2, X-Men: Longshot. Arisa Vol. 10, Bunny Drop Vol. 8, Deathmatch Vol. 1, Doubt Omnibus Vol. 1, Flowers of Evil Vol. 5, IS This a Zombie? Vol. 4, Judge Dredd Digest: Judge Child, Marble Season, Melancholy of Haruhi Suzumiya Vol. 15, Shadowman Vol. 1 Birth Rites.